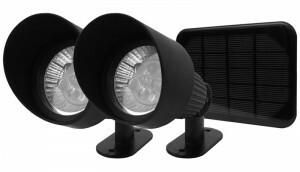 Solar powered lighting is becoming increasingly popular as a low cost way to give ambient lighting outdoors. Solar is much cheaper to install compared with traditional mains lighting. Solar powered lighting is ideal for inaccessible and remote locations that don’t have a convenient mains supply. Performance and reliability in solar lighting have improved hugely in the last few years. The use of LED bulbs has effectively reduced power required whilst also increasing illumination levels. Solar lighting used to require direct sunlight in order to perform effectively. Recent solar technology harvest energy much more efficiently. The speed of technology development is expected to continue to accelerate in the years to come. There are many different types of solar lights. Lanterns for wall mounting. Lanterns for post or hanging mounts. A variety of different styles of fairy lights. Deck lighting which is designed to recess so it sits flush with the deck timber. PIR sensor solar security lighting. Light units will either have a solar panel built into the lighting unit, or it will be connected to a remote wired panel that can be situated in the best position to harvest natural sunlight. The best design for you will really depend on where you are going to position the lights. With external panels, you can position them for maximum sunlight. Being larger, they also harvest more light faster. Replacing factory fitted rechargeable batteries with high quality batteries will improve your solar lights’ performance. Your solar lights will work better and for longer with high quality batteries fitted. As with house buying, with solar lighting, it is all about location, location, location. If possible, place your lights in direct sunlight for the bulk of the day. If your lights spend too much time in the shade then their performance will be reduced. Shadows cast over your solar lights will reduce their ability to charge, so position them with thought. During the next few years, as renewable energy becomes more and more important, we can expect solar energy recovery and storage to further improve lighting performance. The annual sales of solar lighting products are growing every year.